a dibasic amino acid, one of the nonessential amino acids, widely distributed in proteins and found as an excitatory neurotransmitter in the central nervous system. The l-isomer is one of the amino acids occurring naturally in proteins. The d-isomer is found in cell walls of many bacteria. /as·par·tic ac·id/ (ah-spahr´tik) a nonessential, natural dibasic amino acid occurring in proteins and also an excitatory neurotransmitter in the central nervous system. Symbols Asp and D.
A nonessential amino acid, C4H7NO4, found especially in young sugarcane and sugar-beet molasses. The l-isomer is one of the amino acids occurring in proteins. 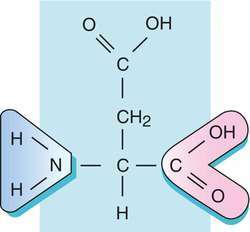 An AMINO ACID which the body can synthesise. It is found in sugar cane and sugar beet and in asparagus. Fig. 53 Aspartic acid . Molecular structure. one of 20 AMINO ACIDS common in proteins. It has an extra carboxyl group and is therefore acidic in solution. 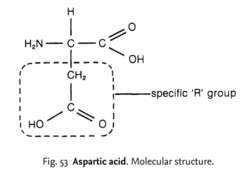 The ISOELECTRIC POINT of aspartic acid is 2.8.